Gamers are likely no stranger to the Neo Geo and its unique catalogue of fighters and arcade shooters, something you could argue is being further assisted thanks to Hamster Corporation’s more recent efforts in bringing them to current systems. So far we’ve seen the likes of Metal Slug, King of Fighters and even some more obscure titles make the leap over to the Switch but there is one name that rather disappointingly has remained absent. Until now that is. Windjammers (or Flying Power Disc as it was known in Japan) has built up a pretty dedicated following over the years, the game easy to pick up but packed with plenty of potential for deep competitive play. Rather surprisingly it wasn’t until last year that gamers had the chance to legitimately own the title outside its original Neo Geo release (Japan did see the game make it to the Wii Virtual Console but sadly the West weren’t so lucky) with an updated version from developers DotEmu hitting PlayStation 4. Now Switch owners are being offered the chance to check out Windjammers for themselves too. So what is Windjammers exactly? In it, two players go head to head on a court (not too unlike one you might play tennis on) throwing a disc back and forth until one manages to get it past their opponent. First to a certain number of points wins. Imagine a game of air hockey and you’re not too far off. Players are able to move around freely (unless holding the disc), angle their throw off the walls, lob and even apply spin – anything to try and throw your opponent off. 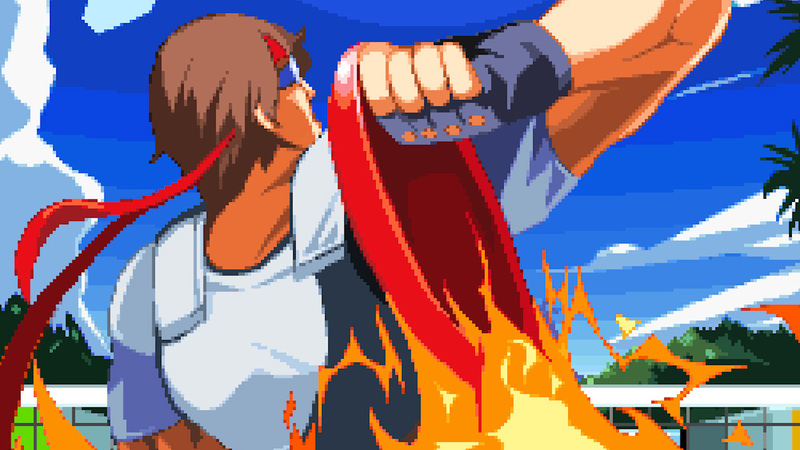 It’s a game that can be enjoyed on a more casual level sure but what helps set Windjammers apart from other older competitive sports titles out there is the surprising level of depth it can also offer. Take for example the way throwing is handled. The longer you hold onto the disc the weaker your toss will be but if you time the throw button perfectly on reception your return will be much faster. Not too complex a mechanic but it does allow for some truly strategic play especially when you vary your holding time and throwing types. Each of the six sports stars included differ when it comes to their speed and power – the smaller contenders much faster around the court but weaker in their throwing ability while the bigger members make up for their sluggish ways through sheer power. It’s nothing we haven’t seen before in a game like this but still warrants trying out each character even if just to get a feel for how they move or even the arch in their curved shots. Another aspect that separates them is their super moves. If you manage to position yourself in the perfect spot for a return and time the throw button just right, you’ll pop the disc in the air and charge up for either a snappier lob, a super spin or your character’s unique super move. The latter is perhaps most interesting as it will transform the discs’ flight often in an unpredictable way. For example, the swift-moving Miller will throw the disc immediately to one side where it will grind along the wall into the goal while the American Scott simply throws against the wall with such force it ricochets around wildly. They bring chaos to the game and in the right set of hands can prove essential in scoring big points. The game features six courts in total each with their own unique characteristics. The beach court, for example, is your default stage; small in size, the bigger score earned for shots that hit the middle of the goal and no gimmicks while other courts might switch the point placements around or even include bumpers in the centre to add further bedlam to a match. Every court feels pretty well thought out and had us rotating between them often. Developer DotEmu hasn’t merely done a quick port here, this new version offering the usual upgrades we’ve come to expect from these types of retro re-treads. More than that though, the game even features new HD menu art, improved music and also online multiplayer including both ranked and unranked options. While this is a game that benefits from local multiplayer, it’s still neat to be able to hop online and find yourself an opponent with a good enough connection relatively quick. The game does include a single player arcade mode that sees you taking on all six characters on all six courts with a couple of mini-games sprinkled in for good measure. Throwing discs at bowling pins or to a dog on the beach are cute ideas but lack real substance. Still, this mode is a great way to hone your skills the computer putting up a real fight when set to hard difficulty. Windjammers is at its best when you’re sitting down with a friend and going head to head. It’s exciting, fast-paced action making for one of the purest and best competitive experiences the Switch has to offer. It’s easy to get lost in Windjammers, one game turning into five turning into ten turning into many more. Even if you have a group playing, rounds are quick enough and the game exciting enough to spectate you’ll still have a great time. It’s great to see more gamers have the chance to try out the once forgotten arcade gem Windjammers for themselves. The game strikes that perfect balance of simplicity and depth featuring action so fast-paced and on the edge of your seat, you’ll have a tough time putting the controller down. Best of all though, it manages to make playing with a Frisbee look cool, and any game that can accomplish that is okay in my book.